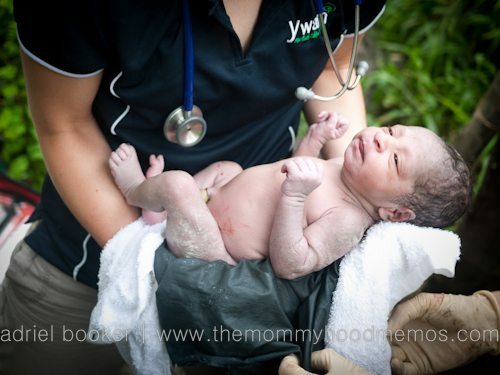 Seeing a woman give birth on a small board in the mud has given the term “in the trenches” a whole new meaning for me. In my twelve years of work in developing nations I’ve never seen birthing conditions quite like this. She reclined on a board not even as wide as her body with two small logs running perpendicular on one end, presumably for a place to rest her head. 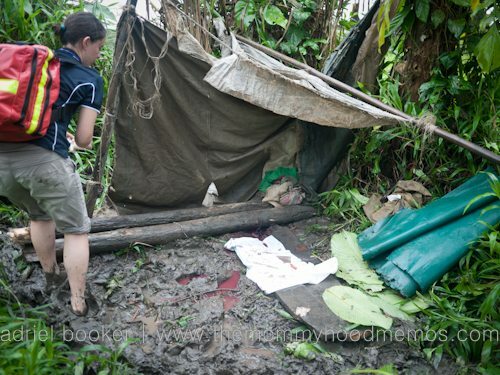 A tattered tarp was strung between sticks and a tree on one side, not even large enough to shelter her from the rain. We stood in ankle-deep mud – clean water nowhere in sight. But there she was – a beautiful, healthy mother, holding a beautiful, healthy baby girl, just minutes old. Bokoro was clearly uncomfortable but didn’t say a word. Earlier that morning we had visited her after learning she had started contractions the night before. Our volunteer midwife Faye performed her first and last prenatal check and we all smiled during the precious moments Bokoro heard her baby’s heartbeat for the first time through the fetal doppler. Since the baby was not yet fully engaged and her contractions seemed mild we left Bokoro with a clean birth kit and explained how to use it to the teenage sisters that would be helping her deliver. Glad to have seen such a healthy-looking mama, we left her to their care knowing the baby could come later that day or in several days time. A few hours later the girls came to get us. 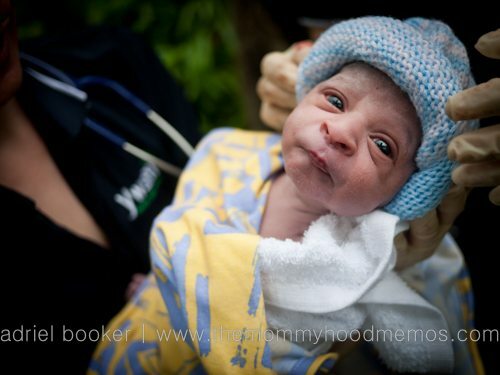 Bokoro was in third stage labor and the “baby’s home” (the placenta) was not coming out as it should. Angharad, our volunteer doctor from New Zealand, was able to remove it before hemorrhaging threatened Bokoro’s life. 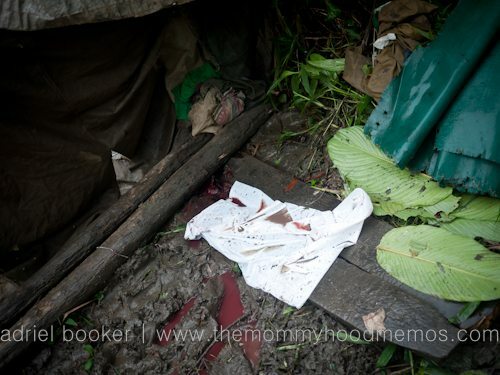 Bokoro shuddered as the rain picked up and her tiny newborn daughter began to get wet. Going inside I found the baby bundle that we had dropped off for her earlier that morning. I pulled out a beanie and a small blanket and a terry cloth diaper that we used to wrap the baby and cover Bokoro’s shoulders. Someone got a large banana leaf to shelter the baby from the rain. As villagers began to gather to see what was going on, my heart was breaking for this woman. She had just given birth in the mud, shared one of life’s most intimate experiences with strangers who didn’t even speak the same language, and now other villagers were showing up to watch our medical volunteers at work. I acted as crowd control, trying to get some privacy and peace for Bokoro. Once I had dealt with the curious spectators, I scaled the shaky ladder and peered into Bokoro’s house asking her husband if we could bring her inside. Surely they wouldn’t leave her outside in the rain with her newborn baby? Surely. 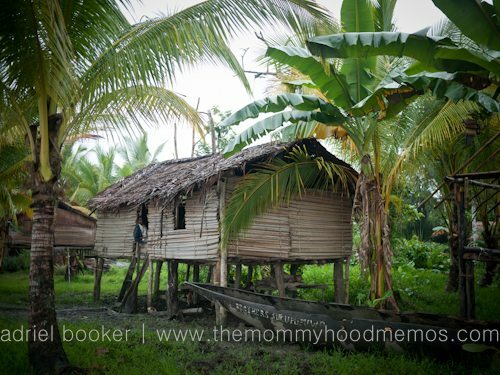 He agreed that she could come in and I held the baby while others helped lift Bokoro through the bamboo floorboards into their thatched home on stilts. 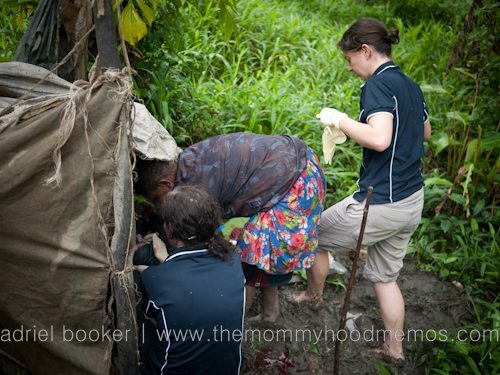 With my heart rate raised I couldn’t help but think “one in seven, one in seven, one in seven” over and over again – the shocking statistic of women who die in childbirth in rural Papua New Guinea. Seeing this was hard enough. I’m not sure how I would have responded had she not been one of the “six” who survived. After making sure that mama and child were near the fire and checking that baby was latching and sucking well, we left them alone to rest and nurse. Several hours later we returned to check on Bokoro and her baby, who had since been named Baro. Faye weighed the baby — a healthy birthweight of 2.75 kilos (6 pounds) — and vaccinated her against the very real threats of Hepatitis B and OPV/Polio. I thought of the disputes in my own nation about vaccinations and the conflicting research findings, but knew in these circumstances that for Baro to have a fighting chance at life, vaccinations were her very best option. The events of that day changed me. I knew that the poverty in this area was acute—if the Western Province was a nation of its own it would be the second poorest nation in the world—but seeing this dear woman give birth on a tiny board surrounded by mud was beyond my comprehension. It shocked all of us, in fact. As I left her house my emergency situation get-it-done-calmly-and-efficiently mode switched to raw emotion as the reality of what I had witnessed sunk in. I began to weep as I thought of my brave sister groaning and pushing in mud. How many times had I sat rubbing my pregnant belly in the mother and child clinic waiting room, grumbling about the two-hour wait? How disappointed was I when I learned that women share double rooms in the maternity ward of our local hospital in Australia instead of having the privacy of a single room to recover? How often had I thought about my “rights” to give birth like this or like that? Just exactly how much had I taken for granted?? Bokoro is one of many. 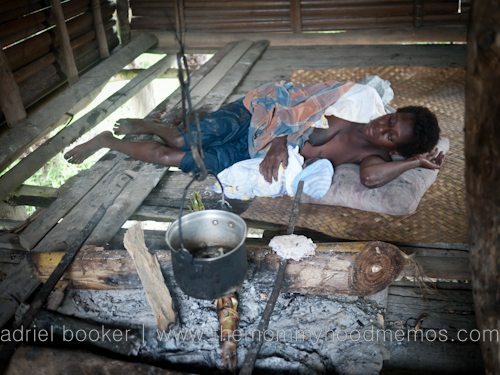 I later found out that it’s common in remote villages like Bokoro’s to give birth outside of the home in a makeshift shelter set up specifically for childbirth. In a larger, more developed village where a Health Station is located and many women give birth in the care of the clinic, I shared Bokoro’s story with Antonia, the head nurse/midwife in charge of the facility. I wanted to know if her story was common and ask why women like her don’t birth inside their homes. Antonia told me that in villages like Bokoro’s they believe the men will get sick with coughing and shortness of breath if they see the blood associated with childbirth. I then asked her when the women would normally return to their homes and was told they stay outside until the lochia stops – anywhere from two to four weeks postpartum. Even now I get a lump in my throat when thinking about Bokoro’s story. One on hand, it was an amazing outcome against all odds – a healthy mother and healthy baby. But it was also heartbreaking to see the conditions that so many like her consider “normal”. Not only is childbirth a very real risk to a mother’s life in this area, but babies are born into an environment where the odds are utterly stacked against them. More than ever I’m convinced that clean birth kits can make a difference, as simple and seemingly primitive as they are. I had conviction before, but now… now I’m absolutely positive. Clean birth kits are only a part of the solution. We don’t know exactly how much of the clean birth kit Bokoro’s sisters used that we had dropped off earlier that morning. Had they washed their hands with the soap? Did they wear the gloves we provided? We know they didn’t use the plastic sheet – we were disappointed to see it still folded up neatly when we arrived as Bokoro’s bare back pressed against the board underneath. But we do know that they used the string and the blade to tie and cut the umbilical cord – that alone a vast improvement from using a rusted machete, a piece of wood, or a rock to cut the baby’s cord. Would Bokoro have survived if our doctor wasn’t there to remove the retained placenta? Would Bokoro still be shivering outside in the mud, waiting for her lochia to dry up, while trying to nurse a newborn and tend to her other two children? Maternal health in the developing world is a critical need. I have as many questions as I do answers, but this I know: maternal health is a serious, serious issue in this area and health education and resources are desperately needed. They don’t need algebra or chemistry, how to write a haiku or the dates of the Second World War. But they do need to know the importance of clean water and hand-washing, malaria prevention and basic nutrition. They do need to know about antenatal care, clean birth environments, third stage labor, and maternal care after delivery. I’m more determined than ever to use my voice and any skills and resources I have to make a difference. Bokoro’s story is a happy one of new life and beginnings, but how many of her friends and neighbors aren’t here to say the same? How many families are missing a mother tonight? Dear friends, I hope you always remember Bokoro’s story and that it moves you with gratitude for your own privilege. I also hope it moves you to make a difference in nations where they have so little. We really can make a difference, if only we are willing to listen, learn, and give. Even knowing her story and seeing pictures prior to this telling of it can’t diminish the impact your words and pictures give it – powerful. Heartbreaking to read but so glad you were there in order to relay it to the rest of us. May we all be changed along with you and may all the efforts of your team and future teams continue to bring change and hope to Bokoro and the communities of PNG. Amazing. Thank you for sharing this story. So glad to hear about how the birth kits are making a difference in these women’s lives, and so thankful for the outcome for Bokoro and her baby. We definitely take our comfort for granted. Thanks Rachel. Yes, and although birth kits are only a part of the solution, they sure do provide a huge measure of improvement relative to what we saw there. Thank you so much for sharing this! I couldn’t wait to read the full story and was so excited to share it with my friends and family. It puts a real face on Clean Birth Kits and why they are so important. It also shares a new perspective on what is normally laughable – First World Problems. I grumbled about having to call my insurance when they didn’t cover my Rhogam shot and it never occurred to me that there are so many women out there who are giving birth in mud and staying outside for weeks trying to care for their new babies. Thank you for all you do and for all you are teaching us! Katie Carr recently posted..Tropical Smoothie Fundraiser! Oh yes Katie! I am not exempt – I’m learning so much too! Thanks for helping to share this important story. I have been waiting oh so patiently to hear your stories from your trip. Thank you so much for sharing Bokoro’s story, it gave me chills and made me appreciate every step of the birth of my son. Thank you so much for going out there and helping these women! Oh Jennifer, I have so many more!! So awesome! I have been checking every day this week and waiting impatiently to read these words! Incredible story and I am sure just the beginning of what you saw. Passing this along to friends and woman who helped with Birth Kits and praising God for the small difference they are making in these woman’s lives. Thank you for your willingness to go and share. God Bless. I cried. I don’t really have words to express how I feel right now (let’s blame that on preggo brain). I’m just so really happy that not only did you manage to gather so much help in making the birth kits but you actually got to be a part of the distribution and that’s so essential for people to see. You know how dearly I would’ve loved to be there too and how much Jason and I have already talked about ‘next year’ hoping that it could be a real possibility for us to join you guys too! Thank-you for working on our behalf!!! And thank-you for sharing the stories here. So glad that Bokoro’s story is stirring people. It was an amazing privilege to be a part of her life and I hope my sharing her birth story will not only honor her, but will be a help to others like her. This is so amazing, Adriel! I’m in awe of you for organizing all of this, and for spreading this message far and wide. What an incredible story. It certainly gives me some perspective about the tiny, insignificant things that didn’t go as planned at my hospital birth. What an incredible blessing you have been and continue to be to all of these women. Yes, perspective indeed. Me too. Thank you so much, Adriel for sharing Bokoro’s story. I am grateful that you are able to get the birth kits and information to us. Each mother we help has a positive effect. It would be so nice for these communities to have a “Red Tent” for women to birth their babies and share their wisdom. Yes, it would. Some of them do have a place allocated like that. But unfortunately, many of them don’t yet. Appreciate your help in caring for these women. Simply an amazing unbelievable story. I can’t even begin to imagine witnessing such a powerful experience. I am so happy to hear that Bokoro and her baby managed to survive. Your post/her story is something that needs to be heard. It makes me feel even more of a calling to help be an advocate for these mothers in under develop countries. Something needs to change. I am happy the the Childbirth kits are making a difference. Thank you so much for sharing such a powerful story. I’m so glad her story has impacted you. Thankful for your help in advocating for Bokoro and other like her! Every voice makes a difference. Wow, Adriel. This is just so beautiful. I’m crying as I read it… especially when I think about how indignant I’ve been about birth situations here in the USA. Thanks so much for sharing. We miss your posts! Lindsey Whitney recently posted..New Friends at #CMLeaders! Aw, I’ve have so much I’ve written about my time in PNG… just don’t want to inundate you guys with it. 🙂 But yes, we can easily take much for granted when it comes to what we’ve been blessed with… I guess we need these sober reminders sometimes. Hi Adriel, I go to Westside and have been following your blog for a while. What a beautiful story and I am glad that Bokoro came through the delivery safely. I am so glad you are making a difference for these women and children. Our God is so good to provide people like you and all the volunteers making a difference in these women’s lives. This is an amazing story. Thank you for sharing it. We would love to cross post on our blog if you are willing.. or even a portion of it. Papua New Guinea is so rarely covered at least in the U.S.! p.s. 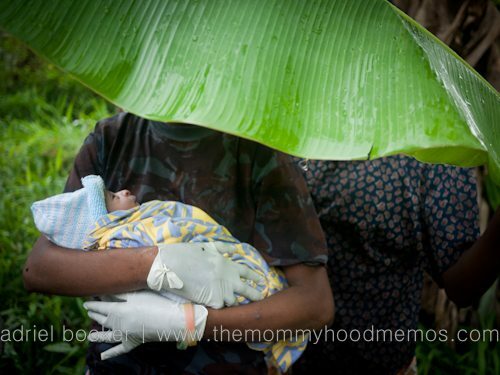 Have you seen the Bloggers for Birth Kits initiative or Project Baby Bilum? Both are for helping mums & bubs in PNG. WOW! How lucky are we to live in Australia where we are looked after very well while pregnant, through child birth and after care. I have shared your link on my F/B page and asked my friends if they would like to help out making up some kits. When do you need them sent out to you? Adriel Booker recently posted..When you don’t feel at home, at home. And yet you do. This was a touching post. I am wondering why the women don’t get together and build a ‘birthing hut”, a dry, clean place where they can give birth. I am also impressed that the husband allowed his wife back in the house- against his cultures values. This might indicate that the men are willing to change their attitudes a bit. I am also wondering why the plastic sheet was not used. Finally, if the beanie & the blanket were mot available, what were they planning to use? As I read your post about Bokoro’s precious child and her astounding entry to this world, my own precious 8 week old is sleeping safely in his bassinet next to me. And I am worried about a little SNIFFLE that he has. Perspective, hey! I have been floored numerous times throughout my pregnancy and post natal care by the health care that is provided to us FOR FREE in this country. I am so thankful that Bokoro’s birth was safe despite the context and that your team was on hand to help with the third stage. How much we take for granted in Australia! 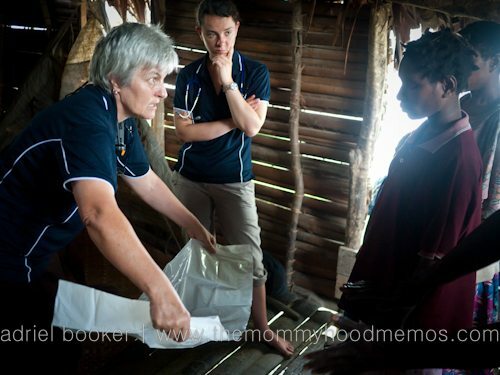 I know you wrote this post a few years ago, but I was wondering if you are still involved with providing the safe birth kits to PNG? How could my church get involved in making and sending some over?